VT BBQ has been coming to the fair for years from Randolf, Vermont. Tasty pulled pork, awesome fries, and other delicious things! North Star Pizza will be at the fair again. 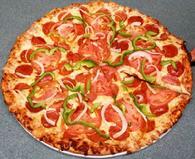 A local favorite serving up some delicous pizza by the slice, or whole pie! They have a great menu at their home base on Route 100 in Wilmington as well. The Deerfield Valley Farmers' Day Fair welcomes concession stands and vendors of all types. The Fair is a four day event drawing approx. 4500 - 6000 people from beginning to end. The first two days of the Fair are 5 1/2 hour days, beginning with the Fair opening at 4:30 in the afternoon. Saturday is a long day 8 AM - 10:00 PM, and finally Sunday 9:00 AM - approx 4:00 PM. A Food concession stand is any stand preparing and selling food on the premise which requires a State of Vermont Department of Health Permit. Food concessions are located on the midway. Sales of the following are not permitted as our midway company has exclusive rights to these sales: Fried Dough/Fried Oreos, Cotton Candy/Candy Apples/Sno Cones, Popcorn, Lemonade & Corn Dogs. An other sales concession is any stand with anything for sale. Other Sales Concessions are located on the midway. Examples of sales include, but are not limited to T-Shirts, Jewelry, Hats, Baked Goods, Raffle Tickets, Bumper Stickers, Dunking Booths and Kissing Booths. However, a donation jar does not constitute an Other Sales concession. (C) Non Sales Concessions $50/10 linear feet of frontage. A Non Sales Concession is any other type of stand located on the midway that is not sales oriented; NOTHING FOR SALE, not even a bumper sticker. If you be selling ANY item, you shall be required to pay the fees associated with an Other Sales Concession as noted above. Having a donation jar does not constitute a sale, and is allowable for a Non-Sales Concession. Commercial Lots are not located on the midway, and are relatively inexpensive. Sales are permitted on these lots, but are less desirable as they do not receive the full traffic of the midway croud. This is the ideal lot for Farm Supply, Farm Equipment, Service Providers, and Car Dealerships. Connections to Electricity and Water can also be provided for a fee. Please download the file below for a full listing of vendor rules, rates, and application. *Concession fees listed cover the entire fair, all four days. Concessions are encourage to attend the fair from beginning to end, therefore, no discount is available for partial attendance, ie: one day only.